ProExam worked with an eight-member Steering Committee (SC) comprised of retirement counselors who had been active in InFRE volunteers activities, and who represented the range of types of employers, areas of expertise, roles, experience levels, and geographic location. The SC served in a consulting and advisory capacity over the course of the study, providing conceptual guidance to ProExam and the Task Force, reviewing and making recommendations regarding proposed and completed activities. The SC met two times via web-based meetings during the course of the study. ProExam also conducted a series of interviews with five thought leaders in the field of retirement counseling in advance of the first task force meeting. These interviews were focused on changes in the profession since the last practice analysis was conducted, how those changes might affect the tasks and knowledge included in the test content outline, and any trends or changes that might impact future directions in practice. Members of the telephone interview panel represented different perspectives, roles, employment sectors, and geographic locations. The Practice Analysis Task Force (PATF) was comprised of nine subject-matter experts. They represented the range of types of employers, areas of expertise, roles, experience levels, and geographic location. 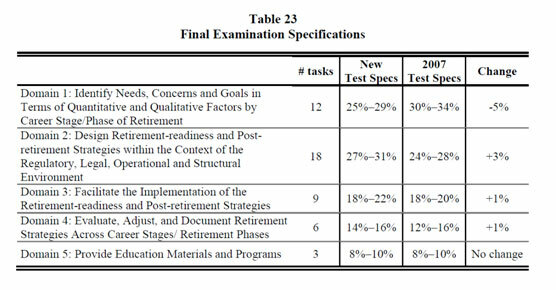 The PATF met numerous times over the course of the study via web-based meetings to update the CRC test content outline to ensure it was current, comprehensive, and reflective of retirement counselors working across the range of professional settings and roles. What is the most efficient way to gather information to build a financial plan? How can you process a lot of customers efficiently? We appreciate your support during the upgrading of this new exam form to incorporate the above important changes to reflect the current state of the retirement industry today.